When I was a kid, the 1958 Steve McQueen movie, “The Blob,” was terrifying. At some point, you get older and realize the horror of the big, gooey monster is just fiction, confined to the big screen. 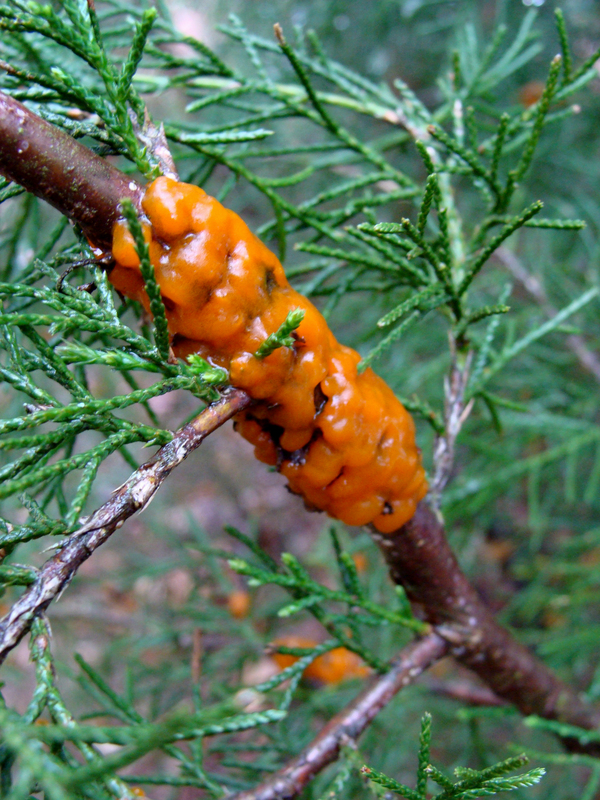 But then, you get even older and realize the blob does exist, and it’s called cedar apple rust. 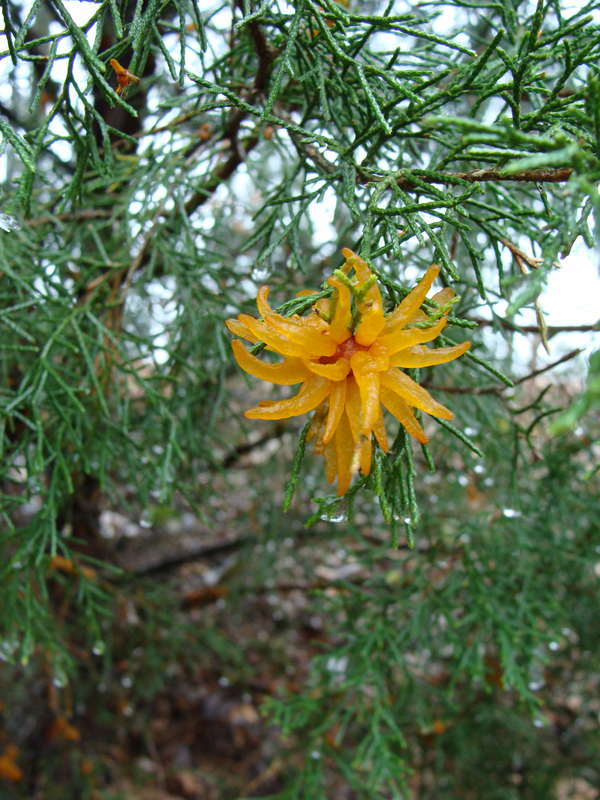 As diseases go, it’s pretty spectacular looking, sort of spider chrysanthemum meets orange Jell-o, all activated by the spring rain. However its fungal glory is short-lived. A week later, the stars were dried and droopy. 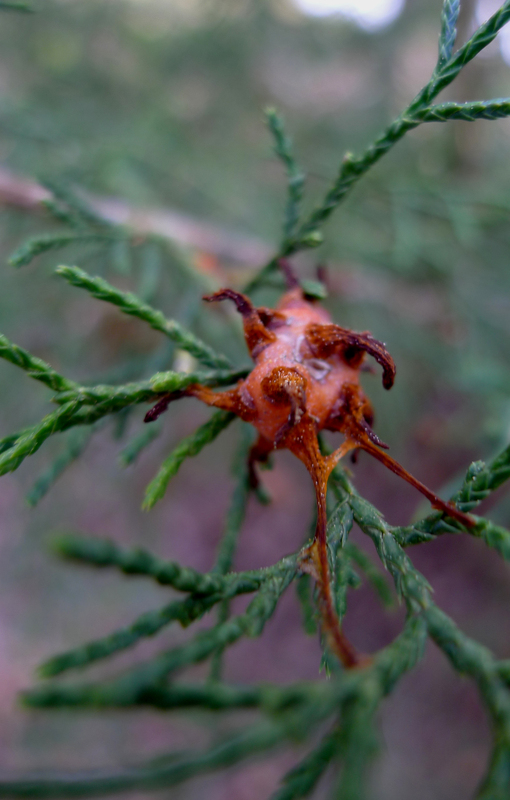 FUNGUS -- One of the larger fungal "stars" of the cedar apple rust that's infected an eastern red cedar on the hill. BRANCHING OUT -- Though the "stars" are the most notable part of this infection, there are more modest blobs on inner branches. A WEEK LATER -- The fungal spore horns shrivel. Finding foods from the homeland, or food that tastes like the stuff you grew up with but can’t duplicate in your own kitchen, is an endless quest. 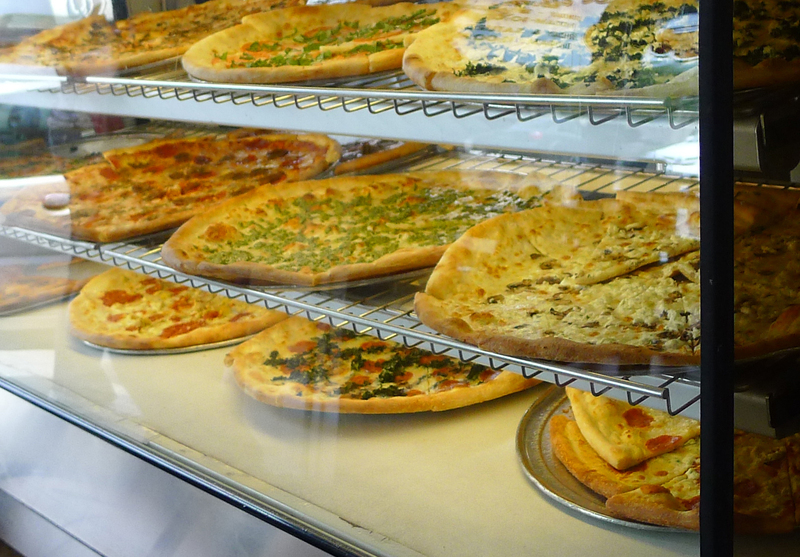 For our family, that culinary holy grail is finding a pie that tastes like it came from the ovens of the Star Tavern in Orange, N.J., or the Starlite in West Orange, N.J. Pizza, cheese only, was a meatless Friday tradition in our house. 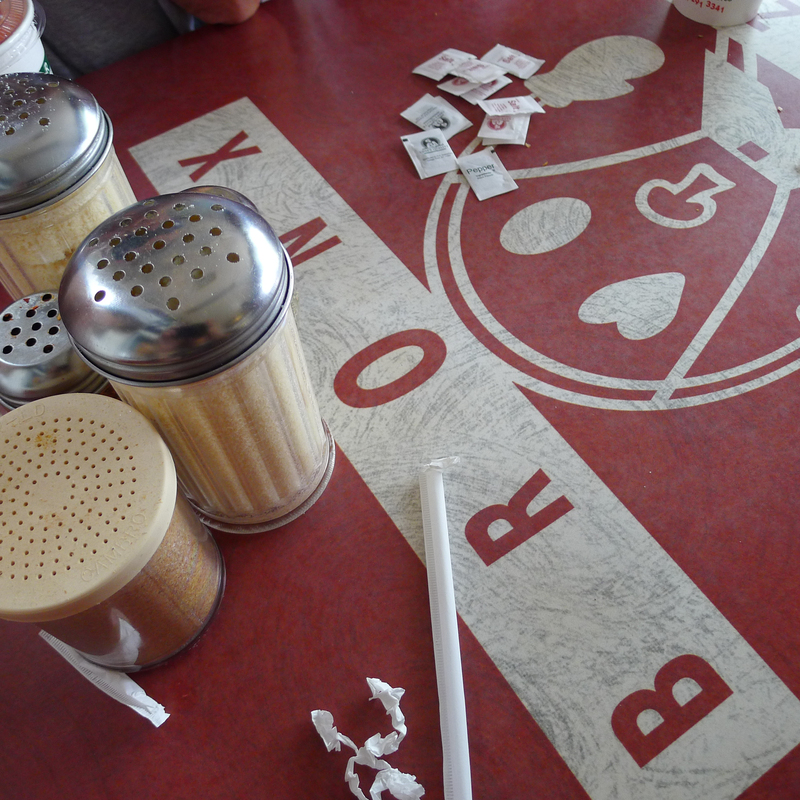 In San Diego, Bronx Pizza [Motto: “Just like back home.”] is one of those places whose name is whispered in hallowed tones among former New Jerseyans and New Yorkers. At lunchtime, the kitchen moved fast, and the line of customers did too. TOMATO PIE -- Ready to eat. 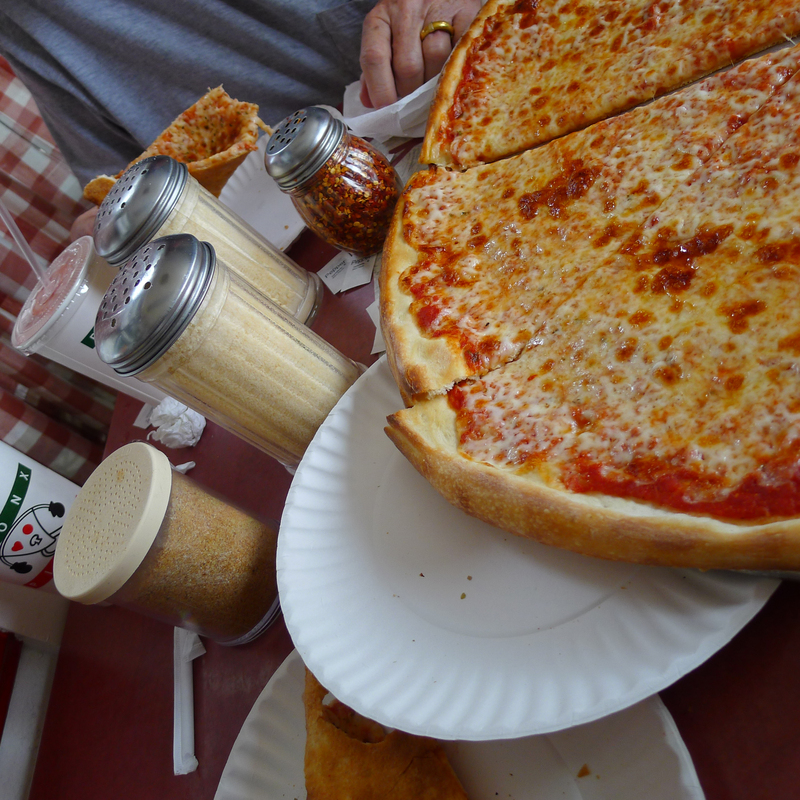 PIZZA DRESSING -- No pizzeria table is properly set without parmesan and red pepper. Oregano at table is a plus. As is typical of our family, the spirit house shares part of the garden with a statue of St. Francis of Assisi [out of the frame]. 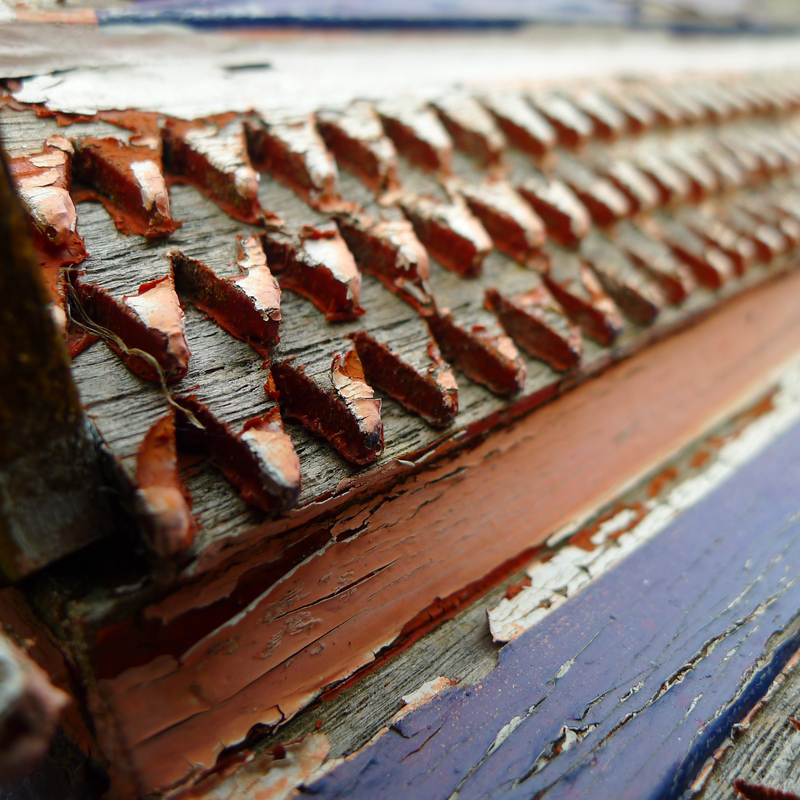 AGING GRACEFULLY -- The tiny painted rooftop shingles only seem more beautiful with each passing year. 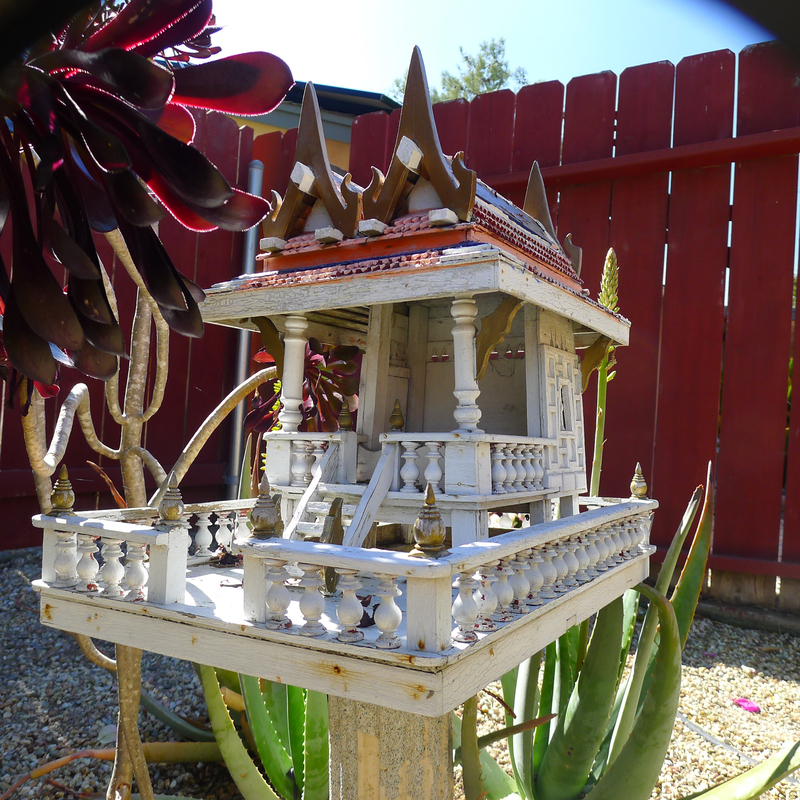 SPIRITED -- The spirit house is embraced by plants in the yard. My father’s Pacific Time backyard is overflowing with color. 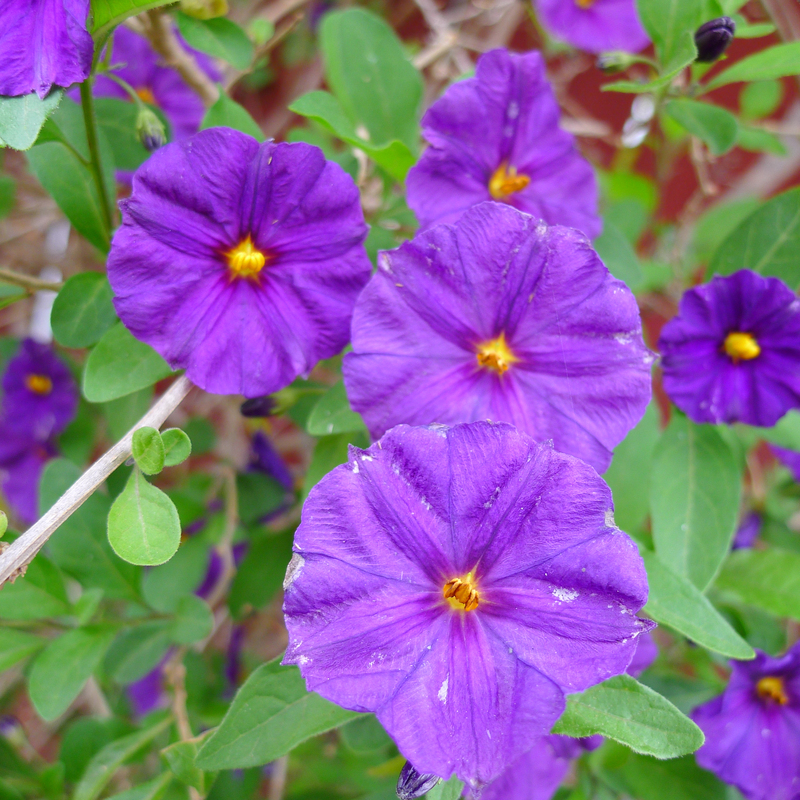 Blue irises, pale coral moon flowers, brilliant bougainvillea and all sorts of other treats for the eye. 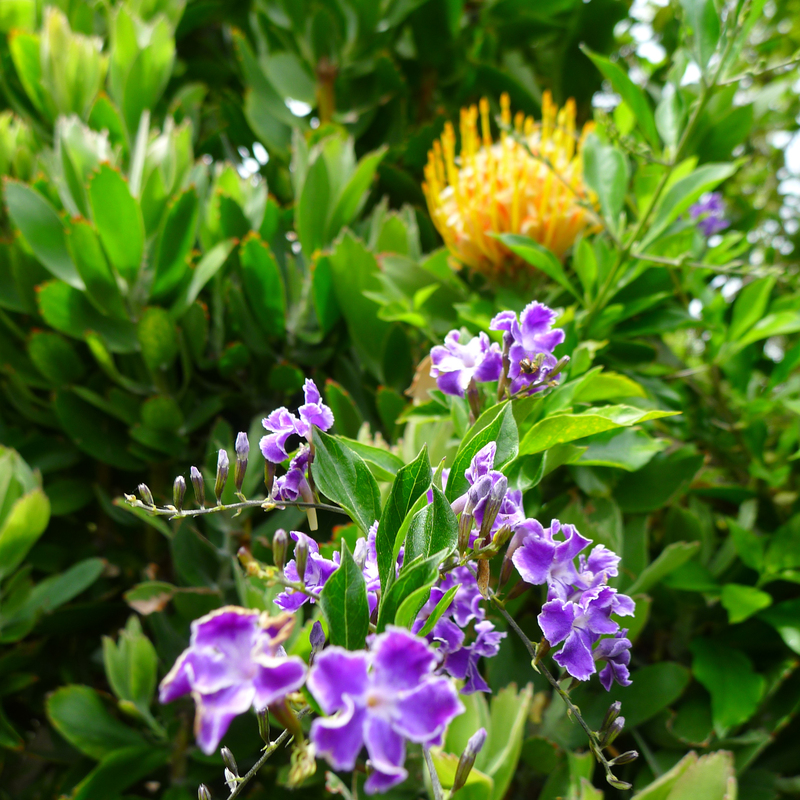 The neighbors’ yards are equally filled with color — trees dripping with exotic tropical flowers, ripening lemons and oranges, and brilliant scarlet pomegranate flowers. Yellows dominate the Central Time Suburban Ferndale mini-gardens. 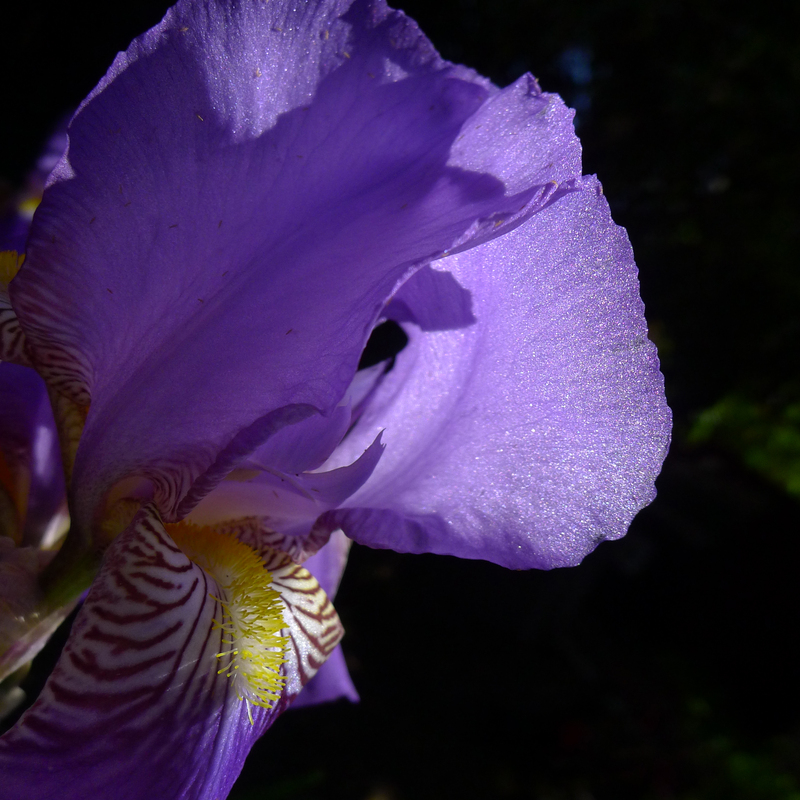 IRIS -- Purple iris with its yellow beard flanked by coloring that looks like it was borrowed from a nautilus. 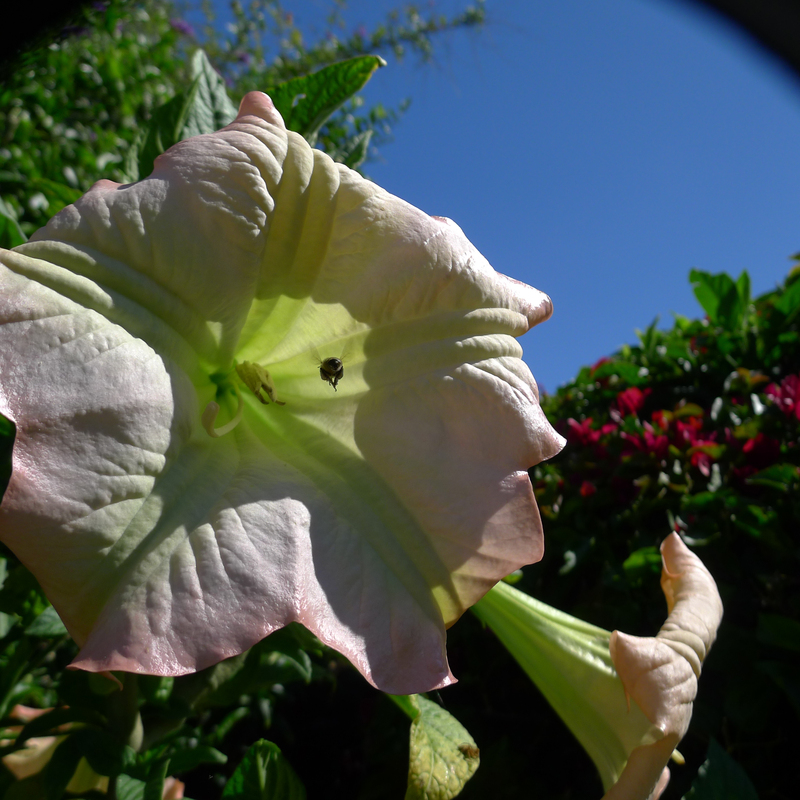 DOCKING MANEUVER -- Bee with pollen-covered legs moves into a moonflower. 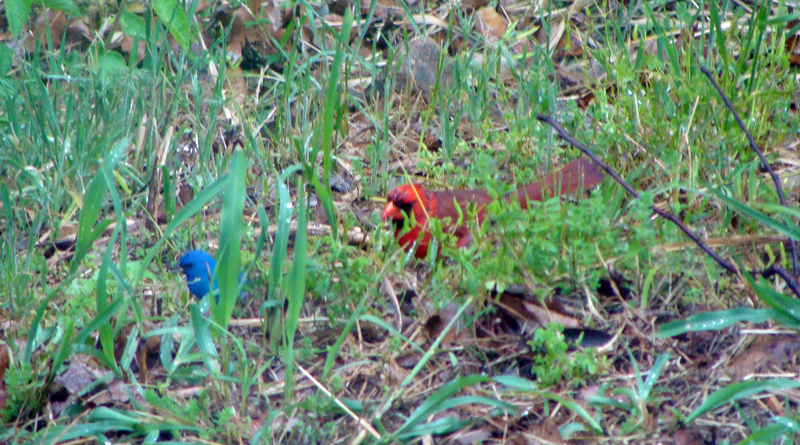 BLUE AND ORANGE -- These two shrubs were growing together in the neighbor's yard. A GOOD KIND OF BLUE -- This shrub was dense with these blue-violet blooms. 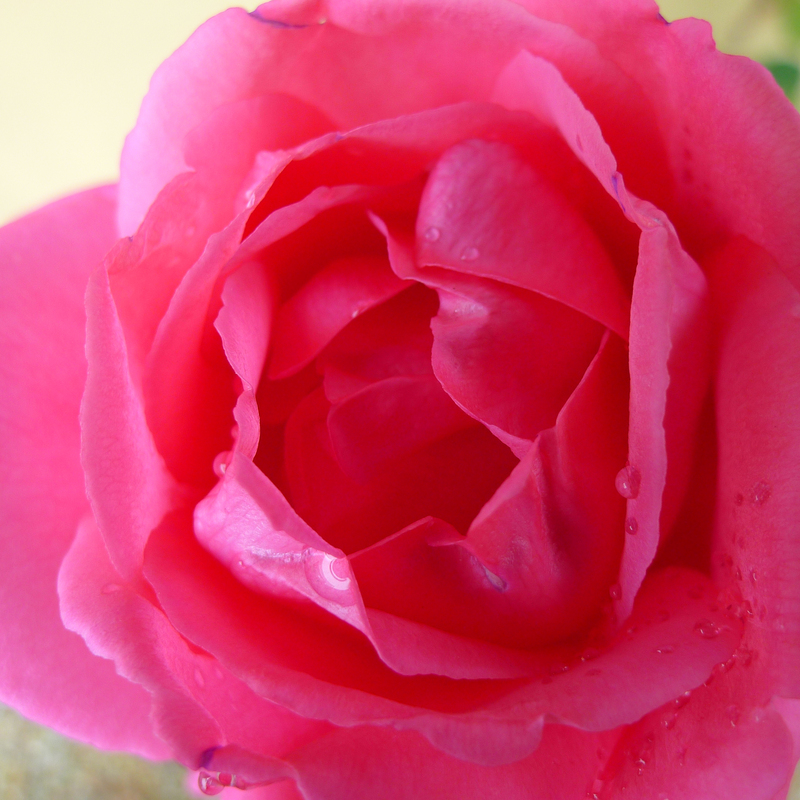 CLASSIC -- Fragrant rose opens as clouds clear away. 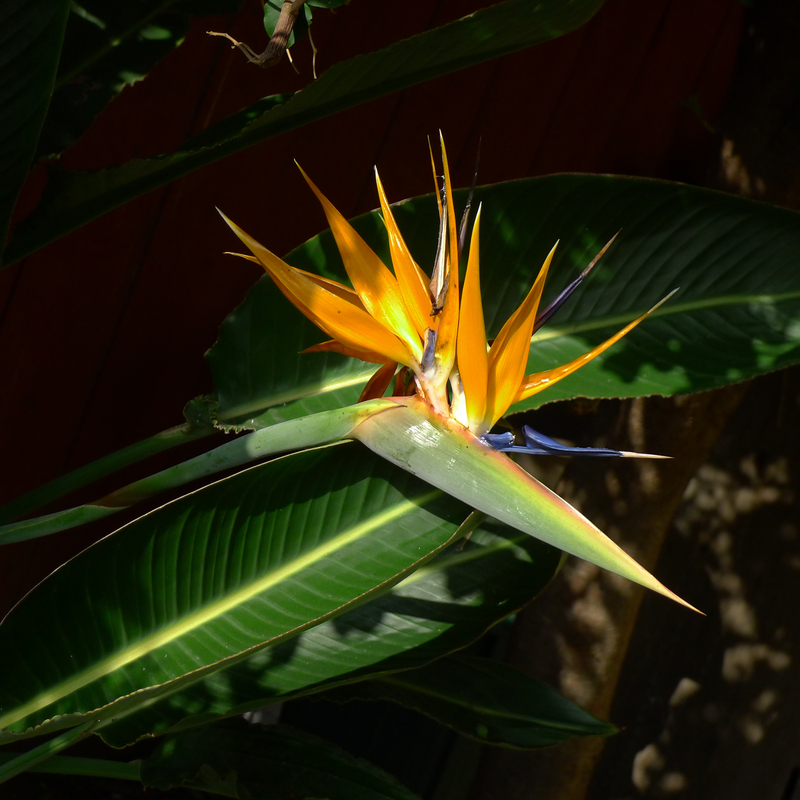 BIRD OF PARADISE -- Like a heron with an 80s 'do. 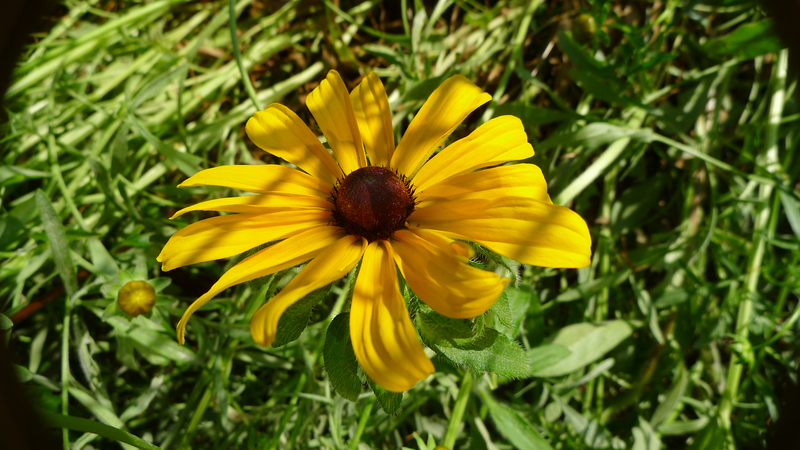 BLACKEYED SUSAN -- Hooray! Something new in the Suburban Ferndale garden. This lone wolf is outnumbered 1 to 200 by coreopsis though. BLACK SWALLOWTAIL -- Pays a visit to the wildflower garden. 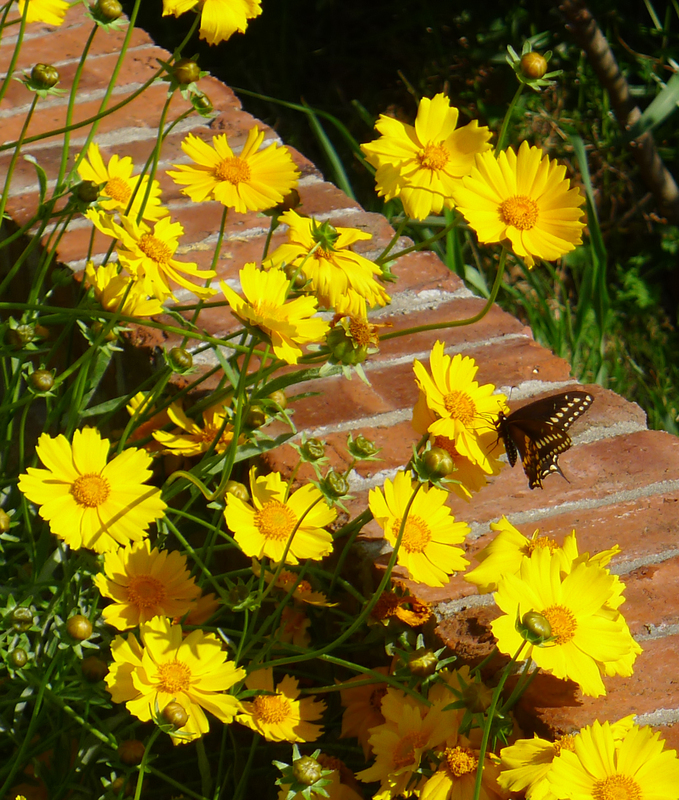 Wildflowers are like cats. You're glad they like you enough to stay, but don't think you actually exert any control over them. Have to confess that I’d never been a great fan of snails. They leave slimy trails, reproduce at alarming rates and can reduce garden plants to Swiss cheese or matchsticks in no time flat. However, I gained a new appreciation for Helix aspersa after spending a couple of days watching these gelatinous creatures with their long eye stalks and crazy quilt helices sliding around my father’s backyard in California. LOOK MA! NO HANDS! 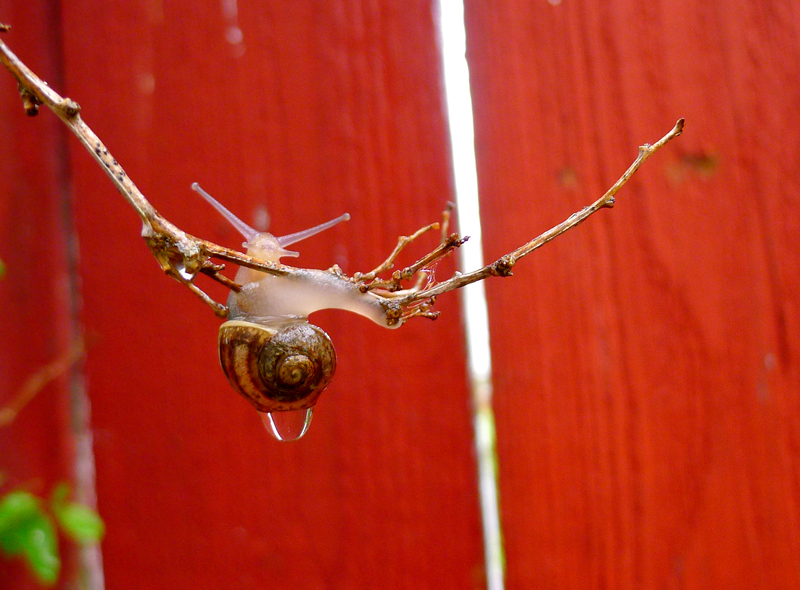 -- This garden snail's slow-mo acrobatics were no less fascinating than anything Cirque de Soleil could do, but without the costumes and music. 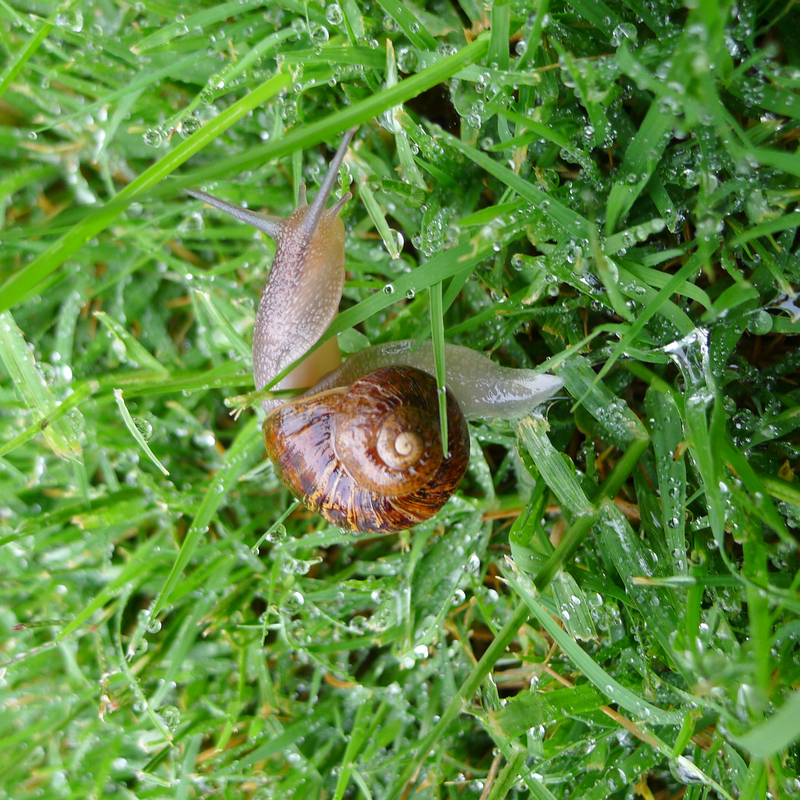 SPIRAL -- Snail heads through the morning dew. 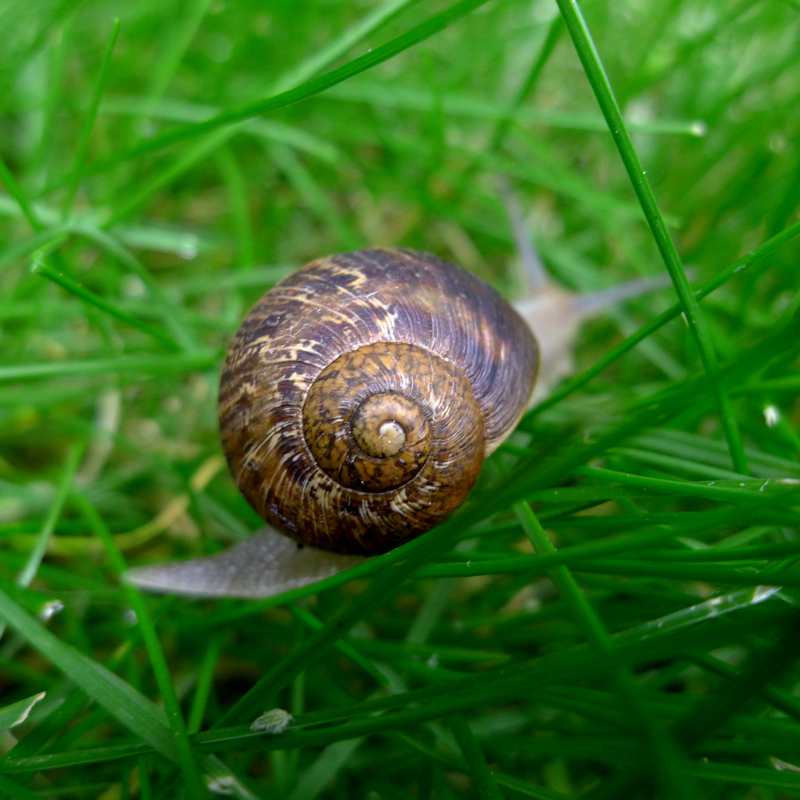 90 DEGREE TURN -- How a snail turns right. 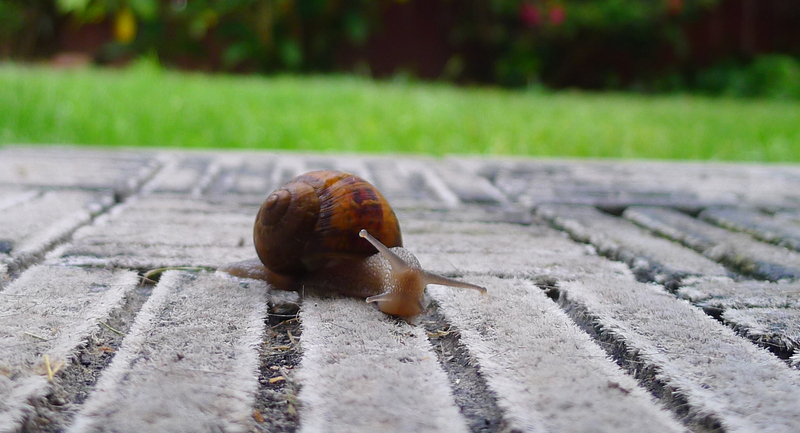 COMING AT YOU -- Snail navigates a door mat. It’s all about togetherness. Most of these photos have been previously published on this site. 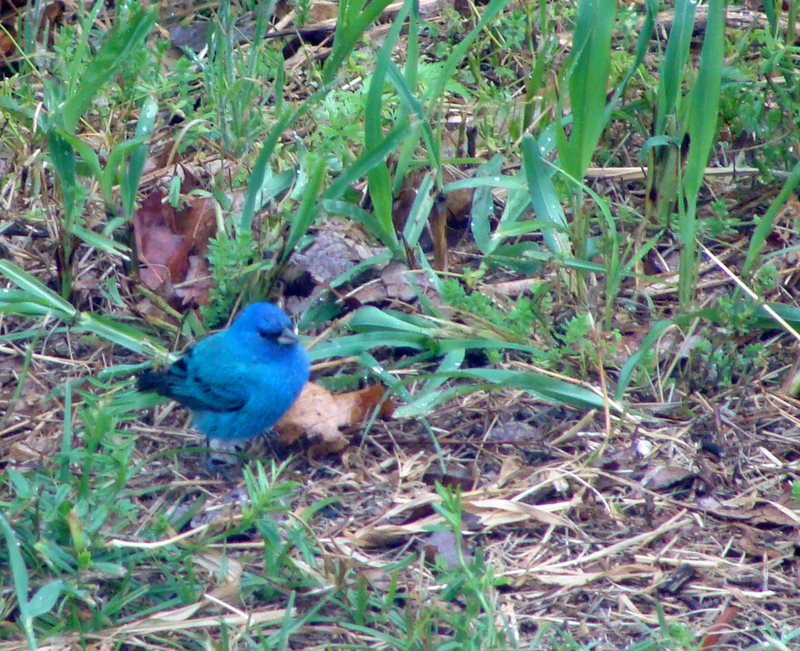 Only the bluebirds are new. 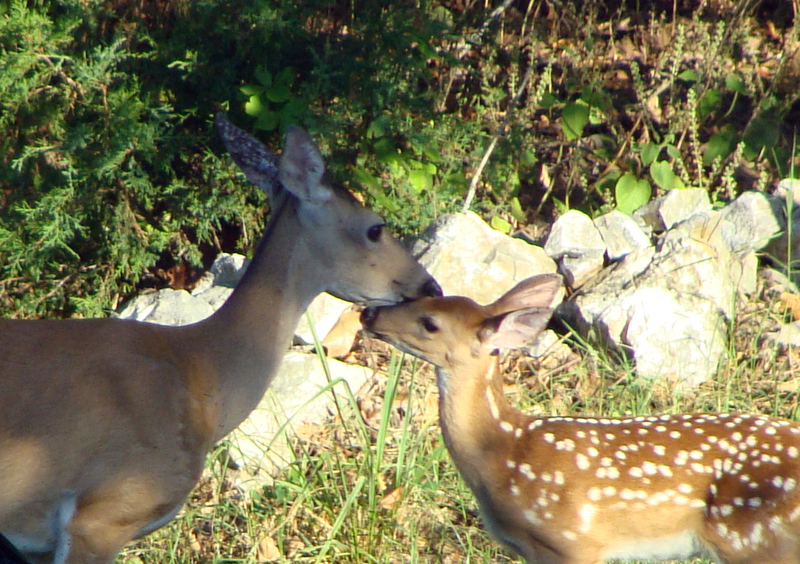 KISS -- Doe and fawn nuzzle after grazing the lawn and before heading back into the woods. 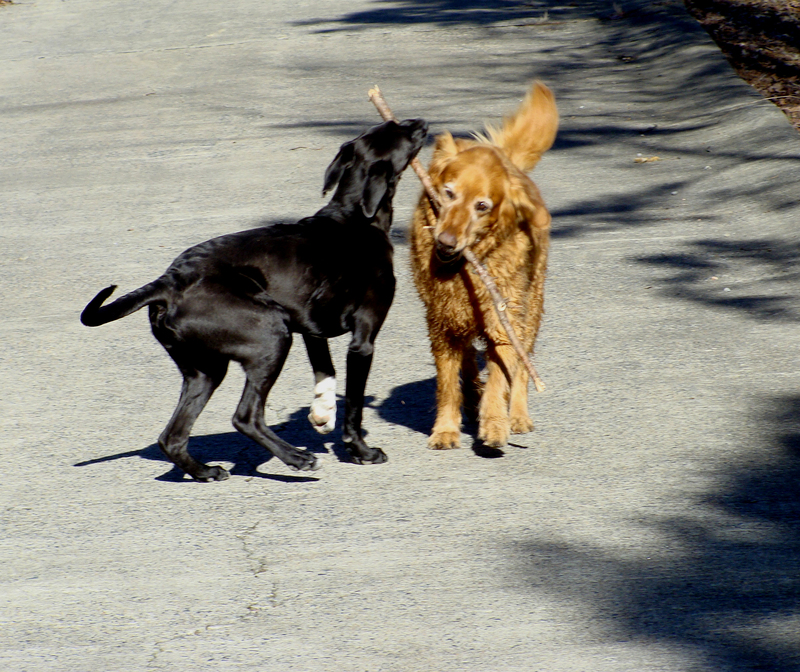 BROTHERS -- The two furry boys from up the road playfight over a stick after a dip in the pond. 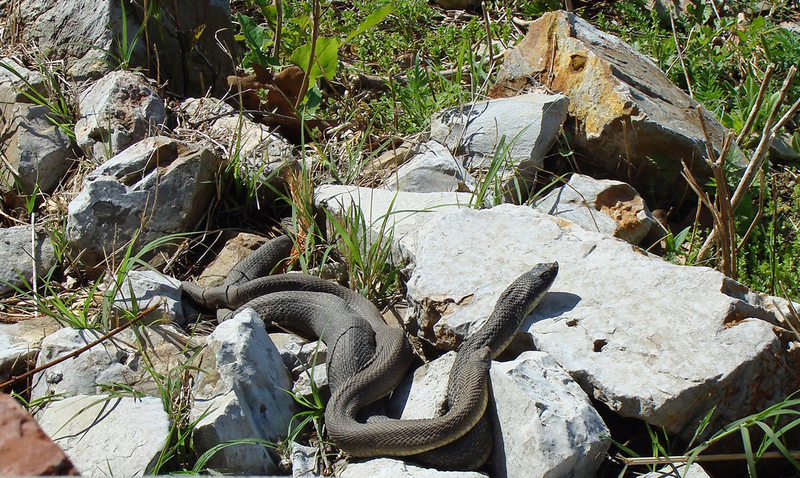 MAKING MORE SNAKES -- Look closely and you'll see two snakes warming themselves in the sun. 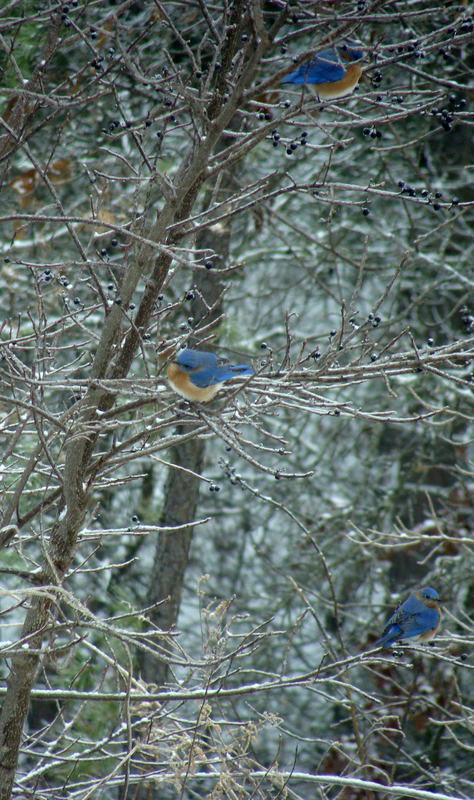 THREE IN A TREE -- Bluebirds fluff themselves against the cold in this January 2010 photo. Favorites from this week are below — the pelicans at windagainstcurrent.com were irresistible. The sun. A little word with a big influence. See how big at http://dailypost.wordpress.com/2012/04/20/weekly-photo-challenge-sun/ for other interpretations of the weekly photo challenge theme. 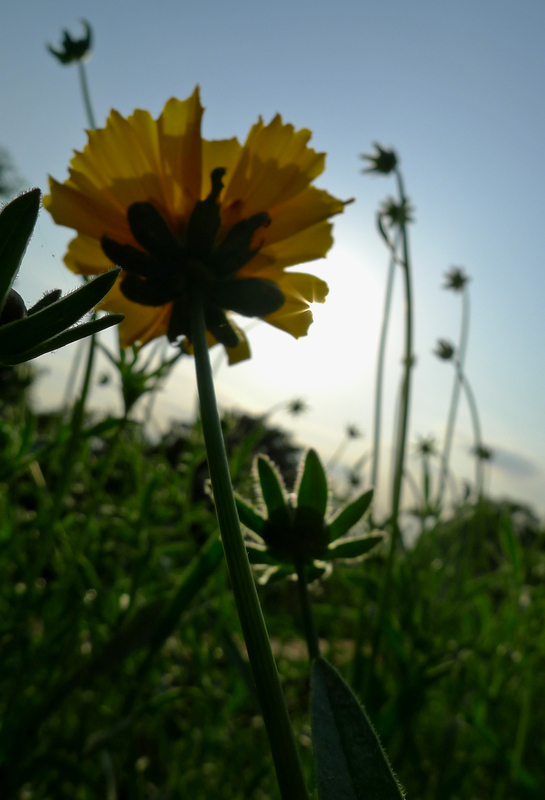 SPARK -- A tiny spark of sunlight radiates from behind the petal of a wildflower. 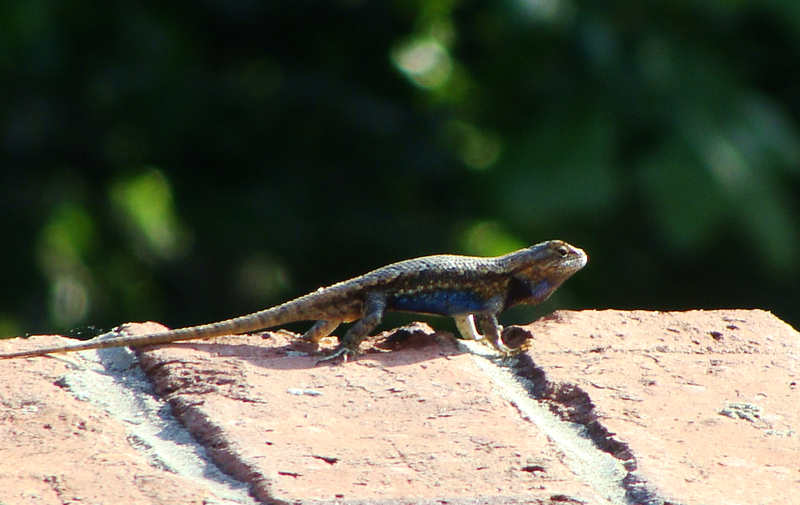 Some random shots of local color. 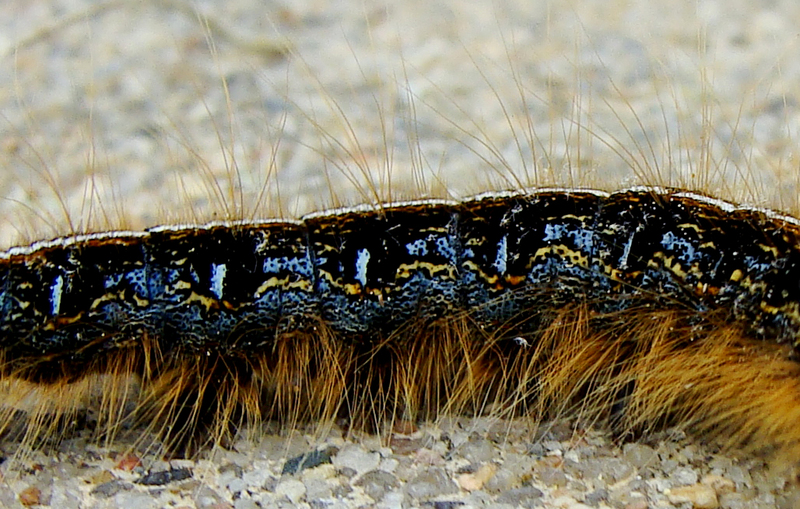 CATERPILLAR - Wandering around the driveway. 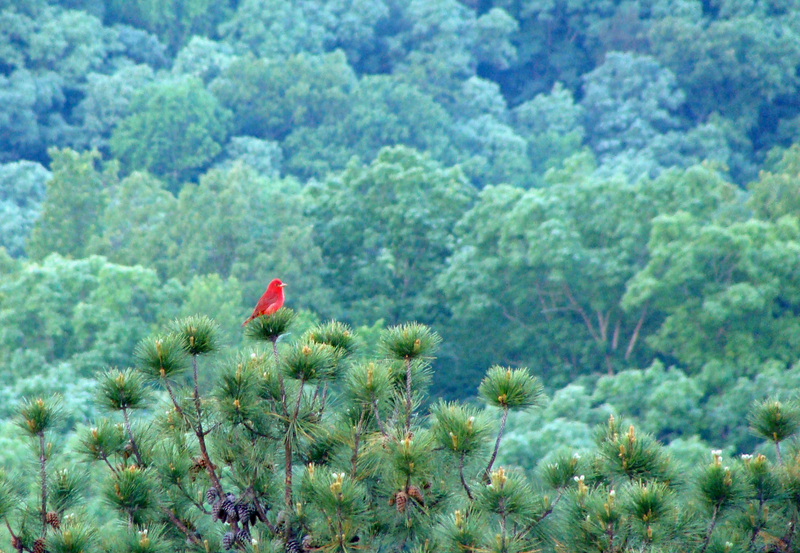 SUMMER TANAGER -- He's back and he's red. Hard to miss him in the canopy. 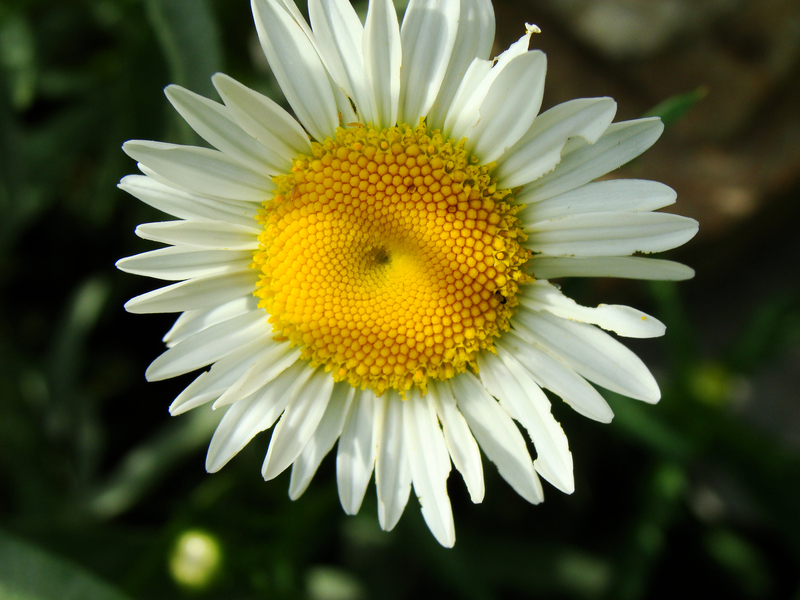 DAISY -- Shadows of taller wildflowers fall across the daisy's face. 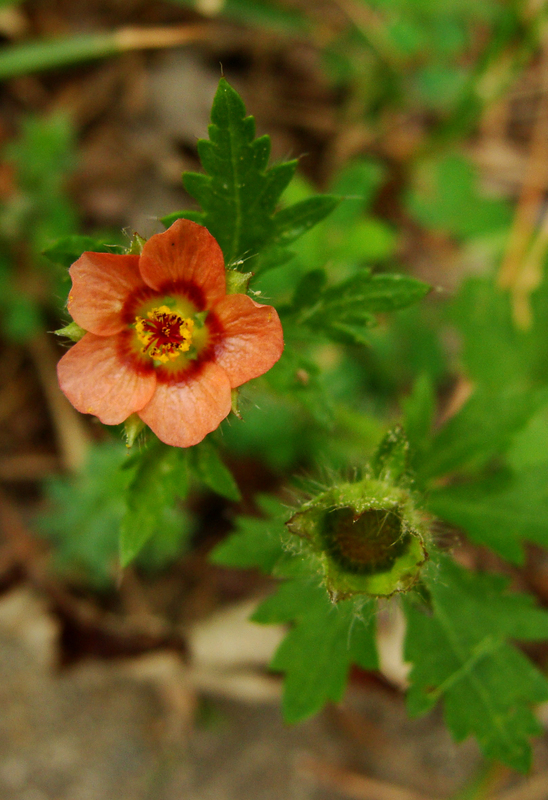 ORANGE -- Tiny flower peers up from the grass. 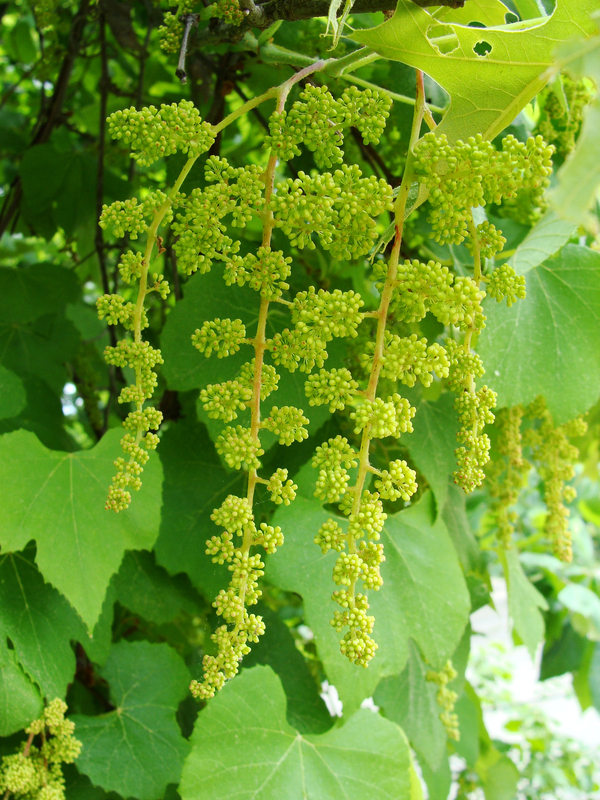 GRAPE EXPECTATIONS -- Grapes ready to bloom. 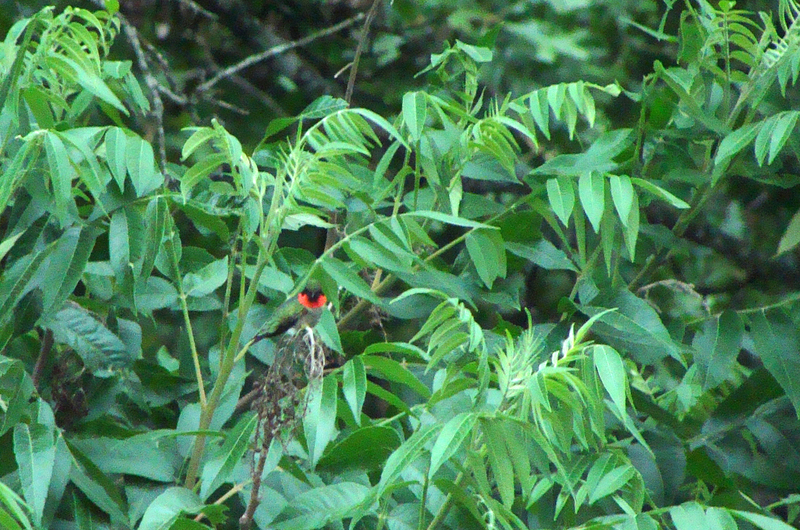 FLASH OF RED -- Ruby-throated hummingbird shows his colors from his favorite perch in the sumac. A photo from the February 2012 archives. Spring came very early to Arkansas this year. 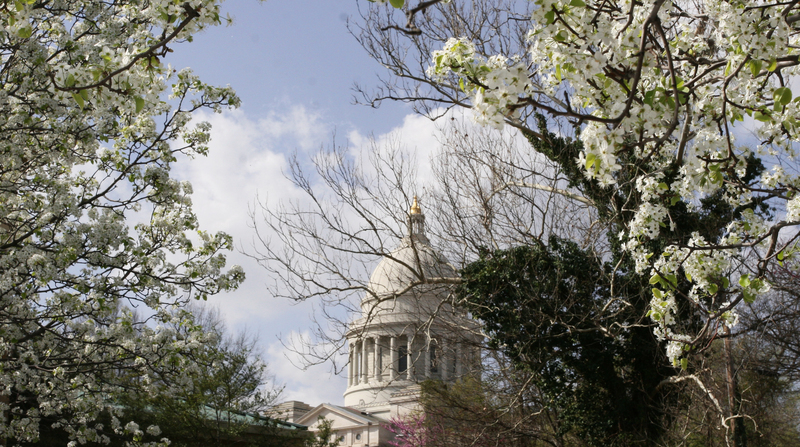 BLOOMING -- The dome of the Arkansas state capitol building framed by pear blooms in February. The shot was snapped from an adjacent parking lot before a meeting at a nearby agency building.